Oh come on, this’s good. For better context, be sure and read Part 1 of this series, where I focused on my fascination with paladins back when I was a sprout. At any rate, as I matured into that awkward stage of life where hundreds of other people my age, drunk to our gills in hormones, are stuffed together in small rooms (at least that’s how I remember high school), my interest in warrior-related class preferences went through a transition. I was exposed to other concepts of what it meant to be a warrior; I studied Buddhism and developed an interest in East-Asian cultures. As a teenager and with the limited resources available to me (the internet was new at the time), the most readily available media came from Japan. I discovered anime and a slew of games, and through it the exaggerated concepts of samurai swordsmanship. Rurouni Kenshin was a big influence. I played the hell out of this horribly mis-painted yet excellent game. My interest in Eastern philosophies, cultures and traditions evolved, though in many video games I played, this manifested in the form of favoring any character who would/could carry a katana – or better yet, a no-dachi. But alongside them came a healthy respect for a class very often seen in fantasy media: the monk. Martial arts, though not a passion of mine, has remained a strong point of interest and respect for me. The monk, in it’s various incarnations throughout games over these last few decades, often exemplified this almost as perfectly as the paladin — except (usually) with that distinctive “Fantasy-Asian” flavor. 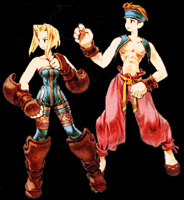 I think my favorite monks were found in Final Fantasy Tactics (which also had samurai and holy knights, come to think of it), though I’ll enjoy most any character capable of standing toe-to-toe with opponents armed and armored in tempered steal, with little more than calloused knuckles and foot wraps. They could punch through steel armor. That’s freaking awesome. Yet the monk, and many martial artist-like characters and classes out there, did not quite resonate as “me,” not in the way paladins did when I was younger. Considering the area in which I grew up and the people I knew there, “Eastern” thoughts and “alternative thinking” kinda left me mostly on my own, save a few individuals. What this, and the appearance of certain influential Blizzard games, primed me for was my fascination with the druid. I cannot remember the first time I had come across the concept of a druid. It might have been during Magic: The Gathering, where they were inarguably green, but at that time I was more drawn to angels. No, it was the Warcraft series, specifically the introduction of the Night Elves, that really got me into things druidic. And yes, I’m well aware of the historical druids of our world. Then of course Warcraft 3 followed by World of Warcraft came around, and having favored the Night Elf faction, I rolled a druid the moment I got my hands on WoW. I shan’t linger on the precise mechanics of that game, nor their place in the world lore. What I’m going to talk about is the concept of a druid, which at it’s core, holds strands in common with the druids of other universes, such as that of Dungeons & Dragons (in its many incarnations), Everquest, and others. Yup, totally what I saw myself as in WoW. At least when I wasn’t getting ganked. Often enough, nature falls in that gray area between clearly defined Good and Evil, Black and White, Light and Darkness. Nature is its own thing. These were ideas to which I could subscribe. The druid felt very “me,” and throughout my college years this could be seen in my work as an Art Major (examples of which I will spare you). But more than that, I learned about the concept of adaptability in terms of character class, and this served to develop my personal psychology to lasting effect. Allow me to paint for you a mental picture. In World of Warcraft, druids were designed to be versatile; not counting actual in-game application (which was in a constant state of flux), the various animal forms a druid could assume allowed for adapting to almost any situation. Turning into a bear allowed for greater hit points and the ability to pull enemies away from your allies; turning into a panther/lion fulfilled the role of a rogue, allowing quick bursts of damage; a moonkin (owlbear to you D&Ders) that blasted enemies with nature magic; and even a tree form to enhance one’s healing spells. Hell, one could even assume the form of a fast beast (a cheetah in the early days, and lately it’s been a stag) for long distance travel comparable to riding a horse, or even take on the form of a bird to fly over mountains and buildings. Sea lion form was available as well, allowing for speeding up rivers and across lakes. One could switch between most of these animal forms in a matter of seconds, without any particular limitation, making druids very slippery and cunning. With so many options available, I found it unfulfilling to play any of the ‘mimicked’ classes. Rogues and Warriors and Mages did their role arguably better than a druid, but that’s all they did. I wasn’t satisfied with that, and this reflected in my life choices as well. How could I adhere to one single career path if it meant specializing in one thing for the next 10 years? Or worse, the rest of my life? How gods awful boring is that? In the next and final installment of this series, I’ll discuss which class with which I most identify myself today, as a matured adult in a modern age. Music selection today is brought to you by, I couldn’t resist, Blizzard. Warcraft 3: Reign of Chaos to be precise, when the night elf race made their debut and druids became “a thing” in Blizzard games (we do not speak of the druids in Diablo 2). This music harkens back to the time before the fall of Blizzard, in the opinion of this humble gamer. This track is known as “Awakening,” the second of the three original night elf tracks, and it was chosen not only because hey, guess what, I rambled on about Warcraft games again, but because this track is unique among “nature tracks” I know. It begins with a determined mood, accompanied by a peculiar blend of drums and mandolin, then fades into a serene, peaceful atmospheric verse. With your volume up high enough, you can hear birds in the back, can almost see the untouched glades hidden amongst pristine, ancient forests; the wild and magical places of the world that druids call home and swear to protect. Then the music builds once more, back into determined, warlike tones of a mindset aware that if one is to be a “nature lover” in a fantasy setting, one must come equip with a savage side. Today’s guest, Terry Murray, talks about the value of using RPGs as a valuable resource for worldbuilding, character development and plotting. Take it away, Terry! Mine is a tale of long ago, back when Steve Jackson’s Generic Universal RolePlaying System (GURPS) was almost new and the Commodore 64 still cool if not hot. A time when machines could not tell much of a story before their memories ran out. Nevertheless, I like to think some of what I learnt as we entered the 1990s will prove of value to a younger generation of cybernetically enhanced writers. My venture in to the world of graphic novels to write, arguably, the first Christian example of the genre ironically benefited from a source many believers then (and now) might disapprove of – rpg reference books. I have found such materials a great help when it comes to fantasy writing. Of course, they also present some potential pitfalls. The first problem role playing games helped me to solve was, so to speak, historical. It is true that the fantasy writer does not suffer the inconvenience of the historical novelist who must constantly take care to be faithful to the time and place they have set their story within. However, I soon came to realise I faced double the challenge. I needed first to create a plausible world, complete with history, within which to set my story and then to ensure I did not break my own rules of existence. Admittedly, it was a fact-filled publication, Whitaker’s Almanack, which proved invaluable when it came to the early number-crunching. A late 19th century edition provided population figures for Australia from which I could envisage low-tech population clusters. While Whitaker’s applied the broad brush strokes it was the rpg handbooks that filled in the finer detail. Using them as “culture catalogues”, I was able to order a collection of nations and people groups to populate the land. The second problem I faced was character generation and plot development. The way I write, I might have a beginning and an end in mind but my story lines tend to be character driven. What happens to them in large part is influenced by who they are. I might place them in a situation but their abilities and personality will colour and to some extent decide the outcome; just as in the “real world” we don’t always have control of our circumstances but we do have a choice as to how we respond to them. I found my rpg manuals an easy and convenient way to access a multitude of professions, abilities and backgrounds when I put together a collection of possible major players. I then played “what if” with a number of them and considered the results. Following these “auditions” I selected my cast and sent them on their way. As their journey changed them, they in turn changed their journey. The rest, as they say, is history. If only it were that simple. The downside with referring to RPG material is one finds oneself spoilt for choice, so like a child let loose in a sweet shop it is tempting to have too much of too many things. From weapons to races, magic to monsters, the world of roleplay would be absurdly overstocked but for the discernment and discretion of those running the games. The writer even more so must filter and distil the mass of possibilities if he or she is to create a world that does not look like a theme park. Where the games master might be generous, the writer needs to be frugal. We need to remember that exotic items, be they weapons or wands, are just that. They should be rare and reasonable. Similarly, you don’t need to be an ecologist to recognise what havoc some creatures would do if let loose upon a world. If you are going to introduce an exotic animal or monster in to the world, one way or another, it needs to fit in to the scheme of things. Finally, when drawing upon such sources for inspiration, we must not lose sight of who rules our universe. Get too caught up in the designer’s game mechanics and we will start to limit our own imagination. Don’t let your story turn into a system scenario (unless you are planning to sell it as such). Would I recommend any particular role playing game? In my case, the Iron Crown Enterprise (ICE) Rolemaster series of the time played a big part in helping me to populate the world, establish its social dynamics and set its degree of divergence from the mundane. But there were a number of other potentially useful games around then, as there are now. What was best for me might not be best for you. If you are considering investing inRPGs as a writing resource investigate the market for yourself and purchase what suits your particular needs. You might even find yourself playing the game!